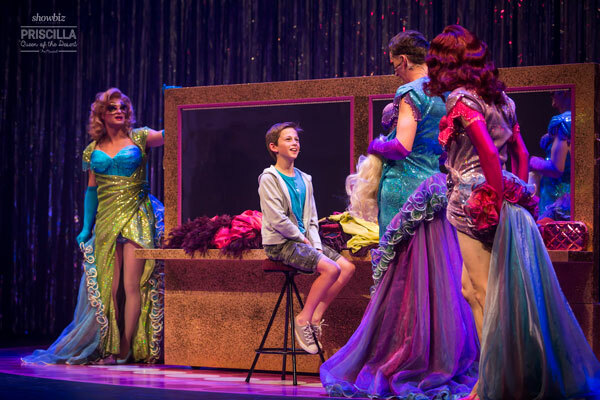 Staging Priscilla Queen of the Desert has to be one of Showbiz Christchurch’s most ambitious undertakings. 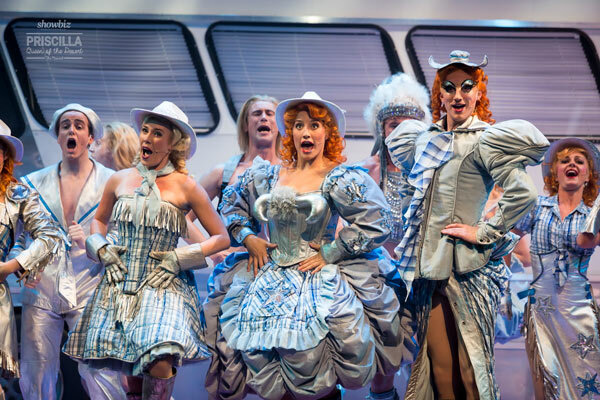 Cast and crew must grapple with the challenges of 500 costumes, 200 wigs and headpieces (primarily sourced from previous productions), the choreography and vocal demands of an array of disco tunes and pop songs and some moments of pure pathos in the midst of camp chaos. For the most part, Showbiz can be proud of this epic spectacle. Full of fabulousness and the original pre-meme Felicia, this camp costumed comedy caper has more mince and flesh on display than the Mad Butcher. More funny, funky, flash cheese than the Canterbury cheesemonger. Not that the story matters so much as the sights and sounds of the sensational set-pieces, but essentially it’s about drag racing across Australia. It’s the tale of two drag-queens Mitzi (Isaac Pawson, last seen in the Court Theatre’s pert musical comedy Legally Blonde, but also swimmingly good in The Little Mermaid) and Felicia (an unflinchingly brave Tom Worthington), and a transgender woman Bernadette (the versatile Cameron Douglas, who impressed in the terrific That Bloody Woman, among many recent Court appearances). The tart, tucked trio are contracted to perform a drag show at a casino in Alice Springs in the remote Australian desert. Beautifully bitchy, they head west from Sydney on a fine feathered, rather reckless roadtrip aboard their pink party bus, Priscilla. Well chosen, the three male leads’ voices blend beautifully, even hampered by unwieldy Ocker accents and some technical sound issues. The sheer exuberance of the entire triple-threat cast matches the calibre of the astonishing OTT costumes, which damn near steal every scene. The touching father-son storyline as well as the budding romance manage to be poignant and heart-warming, amidst the extravagance of hundreds of costumes. The Christchurch crowd is always a bit staid and standoffish to start with but by the frocking-up of the Australian-themed finale the marvellous cast had earned the standing ovation. This accomplished quick-change diva-licious cast deserves a crowd ready to party. Eat your heart out, Adele. Cameron Douglas is particularly impressive as the ageing transgender performer Bernadette, played by Terence Stamp in the film. He is utterly convincing and embodies the tricky role with aplomb. Emily Burns, Jane Leonard and Naomi Ferguson are also fabulous as the three glittering divas that descend on wires from above to provide a kind of camp Greek chorus and knock-out some disco classics. The flying singers are just one of many impressive feats of stagecraft on display in this technically outstanding production. 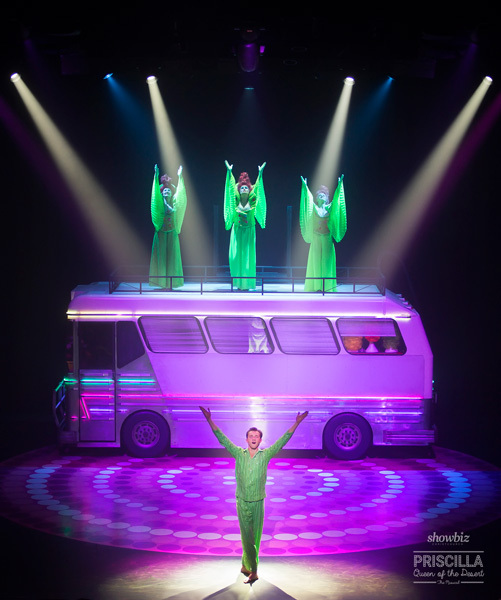 Priscilla the bus becomes a character in her own right – turning on the stage, roaring across the outback and providing a lofty stage for dance numbers. There is also a stunning array of costumes that just keep on coming like an unending waterfall of glitter and feathers. This show is a great excuse to hear some rocking pop tunes performed with style and verve and enjoy some Broadway standard production values. Showbiz Christchurch does spectacle really, really well. 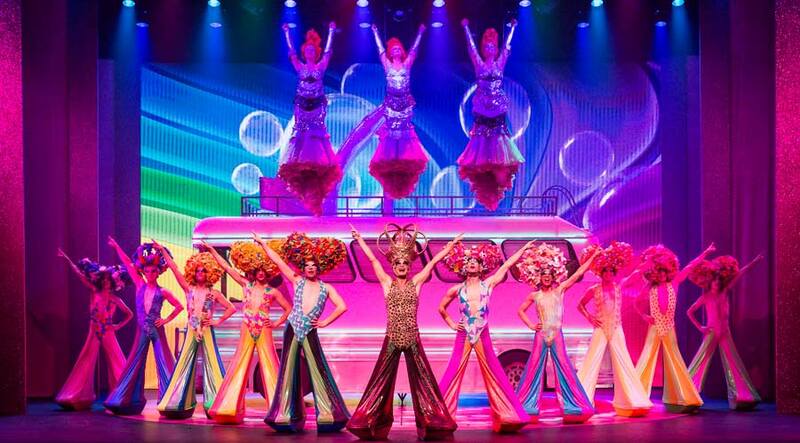 Their production of Aussie jukebox musical Priscilla, Queen of the Desert plays to their strengths; it is a glitzy, glamorous, camp, high energy carnival that really pushes its cast to deliver an outrageously over-the-top evening of entertainment.